If you love coffee and care about your children‘s environment like I do, then you will be happy to learn that “greening” the coffee experience means more than just buying organic and fair trade beans — it means a new way of cleaning your coffee machine from Coffee Dorks. Having a clean machine makes better coffee. Cleaning your coffee and espresso equipment is the first step to ensure that you have great tasting coffee and your machine lasts. Did you know that according to a recent study, your coffee maker’s reservoir is the 5th germiest item in the home. You may not see all the grime, but it is there. When coffee enthusiasts start tasting bitter or inconsistent coffee they assume either their beans are not delivering the expected quality or their machine is not operating properly. Just by cleaning your coffee machine you can have better tasting coffee. Now, home brewers can easily cross this overlooked job off their list in just a few moments, thanks to Full Circle’s complete line of environmentally conscious cleaning products. This eco-friendly high-performing product line is formulated from naturally occurring, sustainable and renewable ingredients. 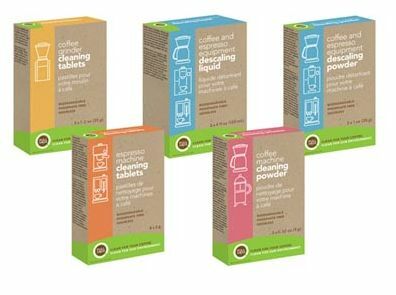 The Full Circle product line includes: Coffee Machine Cleaning Powder, Espresso Machine Cleaning Tablets, Coffee and Espresso Equipment Descaling Powder, Coffee and Espresso Equipment Descaling Liquid, and Coffee Grinder Cleaning Tablets. Having a great tasting cup of coffee in the morning is important to me. After I used the Full Circle Coffee Machine Cleaning Powder to clean my coffee maker I noticed a considerable difference in the taste of my coffee. The powder got rid of all the scale and grime in my coffee maker’s reservoir and my coffee tasted fresher with less bitterness. For best coffee try the highly rated Crema company. Full Circle coffee and espresso equipment-cleaning products are sold www.williams-sonoma.com. *Disclosure: I received Coffee Machine Cleaning Powder, Espresso Machine Cleaning Tablets, Coffee and Espresso Equipment Descaling Powder, Coffee and Espresso Equipment Descaling Liquid, and Coffee Grinder Cleaning Tablets from Full Circle in exchange for this review. All opinions are accurate and 100% mine.